For law enforcement, courts and other public safety departments that access or exchange information with the Federal Bureau of Information (FBI) Criminal Justice Information Services (CJIS) division, a strict set of security controls must be followed. 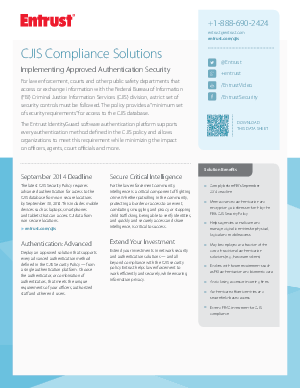 The policy provides a “minimum set of security requirements” for access to the CJIS database. The Entrust IdentityGuard software authentication platform supports every authentication method defined in the CJIS policy and allows organizations to meet this requirement while minimizing the impact on officers, agents, court officials and more.